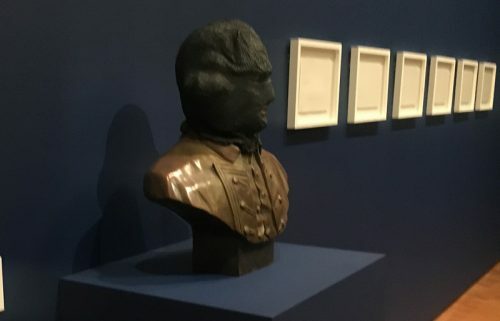 “WE say, ‘bring it on’,” well, the National Gallery of Australia director Gerard Vaughan did this morning as he looked around the huge exhibition that makes up the third National Indigenous Art Triennial at the flagship institution and said, “we know some of these works are going to be unpopular”. You can say that again. With the overarching title “Defying Empire”, the exhibition makes makes it quite clear that the advent of white Australia was anything but productive for Aboriginal and Torres Strait Islander cultures. Indeed one work by Jason Wing, “Captain James Cook”, goes so far as to suggest a parallel with terrorism. And WA artist Sandra Hill in her several works takes a satirical look at the superficial aspects of assimilation in this country. 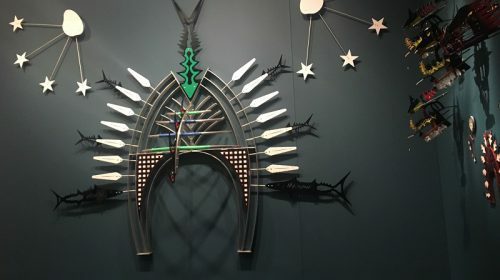 A spectacular central opening area, which features giant reimagined ceremonial headdresses by Ken Thaiday from the Torres Straits, leads into a series of galleries where no fewer than 30 artists are represented, each with between three and seven artworks, making it the NGA’s biggest survey of Australian Indigenous practice. Works include painting on canvas and bark, weaving and sculpture, video, prints, photography, metalwork and glasswork. Ceremonial headdress installation by Ken Thaiday Snr. In the estimate of the triennial’s curator, Tina Baum, such an exhibition would steer Aboriginal and Torres Strait Islander Art back where it belongs, in the centre of the national artistic landscape. 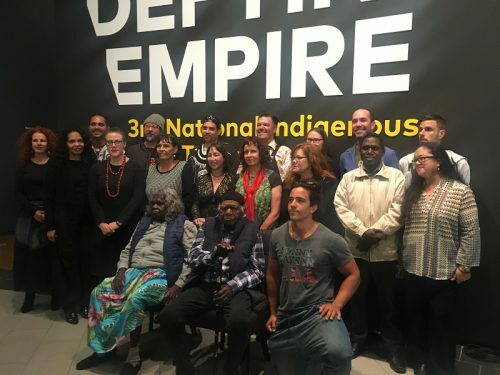 “From stolen generations, to nuclear testing; the Referendum to cultural appropriation; racism to family; traditional practice to contemporary firsts, ‘Defying Empire’ proves art and activism have always gone hand in hand,” Baum said, also predicting that this show, which follows the previous triennials, “Culture Warriors” and “undisclosed”, would show who we are today. 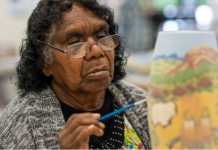 “This is our time for Indigenous art,” Dr Vaughan said, arguing that art could help unravel difficult and complex issues by revealing “voices only heard as a whisper in the past” to bring about a new acknowledgement of the centrality of Indigenous art both in this country and internationally. He also acknowledged the moving words spoken earlier in the morning to participants by Ngunnawal elder Auntie Violet Sheridan, who revealed a very local aspect to the stories told. Jason Wing’s sculpture ‘Captain James Crook,’ 2013, bronze. 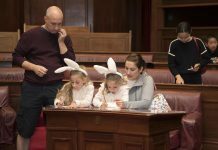 He praised Indigenous art partner Wesfarmers Arts, who is also partners in a series of Indigenous fellowships that had seen around 100 graduates so far. 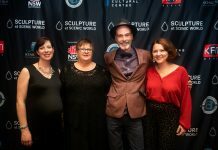 Wesfarmers arts manager Helen Carroll was on hand to commend Indigenous art’s “most profound contribution to world culture”, but she also urged those present to use the triennial to reflect on how far we have to go, even as the 50th anniversary of the Aboriginal Referendum of 1967 was being celebrated all around the country. 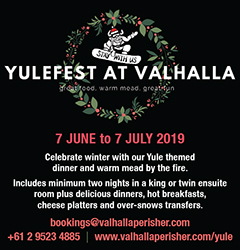 The full list of artists represented in the exhibition is as follows: Tony Albert; Brook Andrew; Sebastian Arrow; Daniel Boyd; Maree Clarke; Megan Cope; Brenda L. Croft; Karla Dickens;Blak Douglas; Fiona Foley; Julie Gough; Lola Greeno; Dale Harding; Sandra Hill; Jonathan Jones; Ray Ken; Yvonne Koolmatrie; Nonggirrnga Marawili; Archie Moore; Laurie Nona; Rusty Peters; Reko Rennie; Brian Robinson; Yhonnie Scarce; Ken Thaiday Sr; Judy Watson; Vicki West; Jason Wing; Pedro Wonaeamirri; and Raymond Zada. “Defying Empire”: 3rd National Indigenous Art Triennial, at the National Gallery of Australia, May 26 to September 10.